Hay-on-Wye is a small mar­ket town on the bor­der between Eng­land and Wales famous for its thir­ty or so book­shops. Since the 1970s, those book­shops, and then the lit­er­ary events they’ve attract­ed, have helped Hay pros­per. With­out them, it would receive a frac­tion of its cur­rent num­ber of vis­i­tors. We don’t think there’s quite an equiv­a­lent ‘beer town UK’, but Sheffield springs to mind as a pos­si­ble con­tender. It has more than its fair share of great pubs and brew­eries: we’ve found that, there more than any oth­er UK city we’ve vis­it­ed, an ordi­nary look­ing pub cho­sen at with­out pri­or research will turn out to be sell­ing some­thing we can get excit­ed about. 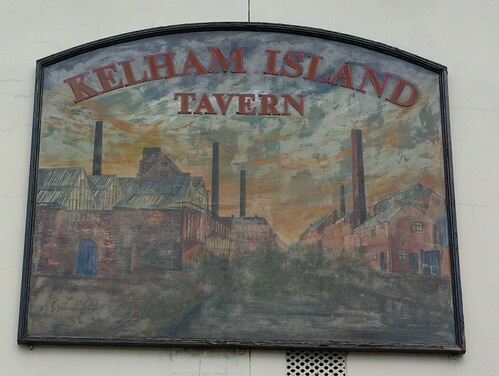 Has any­one mea­sured the impact on beer tourism on Sheffield’s econ­o­my? Has the City Coun­cil con­sid­ered active­ly pro­mot­ing Sheffield as a des­ti­na­tion for beer lovers? With a lit­tle work, it could it be Britain’s Beer­vana. As it is, any­one vis­it­ing the UK look­ing for good beer should cer­tain­ly aim to spend a day or two there. Let us know if there are oth­er can­di­dates we’ve missed. Bur­ton, per­haps, has a greater enti­tle­ment. There are quite a few places that could fit the bill. Sheffield is a good con­tender (but as some­one who has vis­it­ed the city reg­u­lar­ly for many years now trust me when I say there are plen­ty of pubs there sell­ing stuff you cer­tain­ly wouldn’t get excit­ed about – although I guess that depends on your excite­ment thresh­old). But as you sug­gest, what is notable about Sheffield is the num­ber of places that not only sell cask beer when you wouldn’t expect them to, but also sell seri­ous­ly good cask beer as well (Abbey­dale Brew­ery beers seem to be every­where). Else­where York is a seri­ous con­tender. Hud­der­s­field has its fans (and some seri­ous­ly good pubs), as do Der­by and Not­ting­ham. Mersey­side CAMRA like to dub Liv­er­pool the “Real Ale Pubs Cap­i­tal of Britain” and although I don’t know what that is actu­al­ly sup­posed to mean, the City Cen­tre is very well blessed with lots of good pubs. Rather clos­er to home to you two, I have always been impressed by what Bris­tol has to offer on the (admit­ted­ly few) occa­sions I have been there. Beer’s impact on Sheffield is noth­ing like as dra­mat­ic as book­shops’ impact on Hay. if the pubs were crap, Sheffield would still thrive. That;s fun­ny in some ways – I live in Sheffield, and cost con­sid­er­a­tions restrict my Der­by vis­its, but if I was to rec­om­mend a near­by metrop­o­lis to any Sheffield folk seek­ing a des­ti­na­tion with a huge range of pubs, Der­by would be it. I can’t count the num­ber of times I have had great beer in Der­by at the end of a Der­byshire day out. Impor­tant­ly, Mr Johnson’s Hay books/Sheffield pubs com­par­i­son prob­a­bly rings true for Der­by as well (I haven’t fol­lowed your link yet though!). The dif­fer­ence would appear to be Sheffield council’s lam­en­ta­ble dearth of inter­est in any of their her­itage build­ings or pubs. The grass is always green­er, eh? Bris­tol is com­ing up fast and it’s also got its cider her­itage, which is a nice add-on if you’re a fan of the filthy stuff. Sure­ly the Hay-on-Wye of beer would be a rel­a­tive­ly insignif­i­cant place that was “put on the map” by attract­ing peo­ple from far and wide for its beer and pubs. In the old days, Kin­ver near Stour­bridge was not­ed for the unusu­al­ly wide range of beers avail­able in the vil­lage. I’ve not much time, so can’t go into mas­sive detail but in size-of-beer-tourism-vs-size-of-town-and-con­se­quent­ly-of-seri­ous-note award like­ly goes to Nor­wich. Oh, good point, I for­got about Nor­wich. I love Nor­wich. The pubs are splen­did and do real­ly attract a lot of peo­ple. The Fat Cat empire con­tin­ues to grow – on their third pub I believe. Great beer, too. But Nor­wich is a fair­ly big city in its own right, and suf­fi­cient­ly remote from oth­er cen­tres of pop­u­la­tion that it’s unlike­ly to gen­er­ate much “beer tourism” in the way that Sheffield does. Nor­wich is mag­nif­i­cent for real ale, and I’d love to do the city of ale thing there. The Nor­wich beer fes­ti­val is already a firm favourite of mine. How­ev­er, I have lit­tle to no con­fi­dence in Sheffield Council’s abil­i­ty to run a bath­tub, let alone a tourist cam­paign aimed at real ale enthu­si­asts. As such I’m hap­py to let the local CAMRA branch do the lions share of the pro­mo­tion­al work, and maybe bang the drum for the num­ber 43 bus pub crawl from Chester­field to Dron­field to Sheffield, which is start­ing to look like some very nice com­pe­ti­tion for Kel­ham Island. I agree with jesusjohn – Nor­wich is def­i­nite­ly bril­liant for beer. It’s a small place so even the out of town gems are walk­a­ble, and Nor­folk has some excel­lent brew­eries. Adri­an Tier­ney-Jones does a good write up here. I tell you what is a shame – that Bakewell doesn’t gun for the beer tourist pound. Chatsworth House’s Peak Ales brew­ery makes excel­lent old fash­ioned brews and Thorn­bridge is right there. Sad there’s no coher­ent offer for the brew­ery and the pubs. Very dif­fi­cult to find any Thorn­bridge beer in its home town! Sheffield does the busi­ness, of course, and Man­ches­ter is fab­u­lous for beer. I agree Nor­wich already has a tourist trade – per­haps that’s why they’ve been effec­tive at mar­ket­ing their excel­lent pub offer. This leads on to a sep­a­rate debate about over­looked beer towns. I humbly sug­gest Cam­bridge. A city of 100k res­i­dents with 10–11 GBG entries and plen­ty of oth­er good choic­es. Giv­en its class, I’m pret­ty sur­prised the Cam­bridge Blue doesn’t have the nation­al beer geek recog­ni­tion of, say, the Fat Cat or Kel­ham Island Tav­ern. Cam­bridge is a great beer town, used to live there and amazed that the booz­ers I used to fre­quent (usu­al­ly in search of lager) are still going — have fond mem­o­ries of us CCAT lads (now the Ruskin what­ev­er) get­ting into the Free Press snug on Frid­day nights before the row­ing lads from uni. Look­ing not to far from Bakewell, Chester­field is very good for beer. A num­ber of good pubs, 2 out­stand­ing real ale off-licences and quite a few brew­eries. Just a shame that Chester­field is very much in Sheffield’s beery shad­ow. As var­i­ous peo­ple have sug­gest­ed, the point is that Hay-on-Wye *only* sur­vives because of book­shops, so Sheffield, Nor­wich, Man­ches­ter, etc.., aren’t quite right. Bakewell is a good call. Some­where like Haworth, with a bit more vari­ety (not quite so much Tim Tay­lor) and a cou­ple more good pubs might fit the bill.It already has a her­itage rail­way with beer onboard. I had nev­er con­sid­ered a council’s role in pro­mot­ing the beer in a city until I read Tandleman’s review of (a) Bel­gian beer fes­ti­val where the town coun­cil is so keen to pro­mote the fes­ti­val that its free to get into the munic­i­pal venue.